The Odorox® Boss™ is the right choice for the professional fire and water damage restoration contractor. It can deodorize and decontaminate up to 2000 sq.ft. 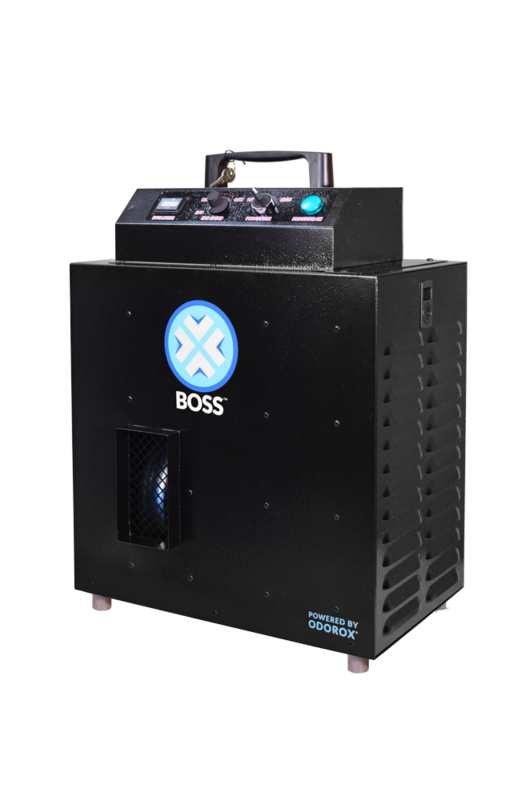 The Odorox® Boss™ is designed for heavy concentration processing and operates using only 1.9 Amps. The Boss™ is equipped with a selector switch for 1 or 2 Odorox® hydroxyl generating optics and a washable filter. The built-in fan is adjustable from approximately 250 to 500 cfm which makes this unit very versatile. Turn the fan to low to deodorize small areas such as cars, RVs, boats, bedrooms or offices. This setting is also ideal for tenting damaged contents on-site. Turn the fan to high and you have the ability to treat larger areas such as basements, homes and businesses. After two days, there was a noticeable reduction in odor and after five days, the odor was completely gone. This impressed not only me, but the homeowner, oil company, and the environmental engineer sent to monitor the air quality. I have to let you know how happy we are with the results we achieved with the use of ODOROX® HYDROXYL. Being in the fire restoration business, we come across many unusual odors. In the past, we have relied a great deal on Ozone Technology to deal with these problems. One particular odor we have come across a number of times throughout the years is home heating oil. It is one of the most difficult odors to remove. After purchasing the ODOROX® equipment, we set it up in a residential basement. After two days, there was a noticeable reduction in odor and after five days, the odor was completely gone. This impressed not only myself, but the homeowner, oil company, and the environmental engineer sent to monitor the air quality. The equipment seemed expensive after being purchased, however the results were great. I definitely recommend the use of ODOROX® HYDROXYL Technology.